Part III features two useful case studies. Both stem from the authors' hands-on work and consultation with teachers, students, and parents. 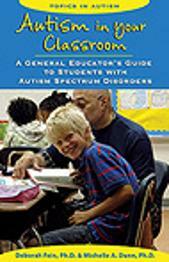 The book concludes with an appendix of frequently asked questions about children with autism asked by educators. Parents of young children--ages 18 months to 5 years--recently diagnosed with autism, face the critical decision of which educational treatment program to choose for their child. To help guide them through this complex decision-making process, parents can turn to the revised and updated edition of Right from the Start. This second edition covers programs that use Early Intensive Behavioral Intervention, a highly effective treatment based on Applied Behavior Analysis (ABA). New information includes the latest research on the benefits of Early Intensive Behavioral Intervention, the types of instruction used (naturalistic instruction and other teaching methods that complement ABA), home-based professionals and their credentials, school-based programs, and more. Comprehensive in its coverage and full of personal insight, Right from the Start is an essential primer to help families explore the options and select the educational treatment program that best suits them and their child's needs. The many professionals who work closely with these families can also benefit from reading this book. Most of us use visual supports in our daily lives--for example, a shopping list, calendar, or a roadmap. Visual supports are particularly beneficial to people with autism because they help make abstract concepts concrete and capitalize on the user's inherent visual learning strengths. Most of the visual supports presented in this book are low-tech and easy-to-use, making it simple for parents and professionals to create their own, suited to the needs of their students. Inspiring success stories will further motivate parents and professionals to get started. Apply a systematic approach to instruction that consistently employs proven methods for teaching people with autism including verbal prompting, reinforcers/rewards, chaining, graduated guidance, shaping, modeling, visual supports, etc. Teaching by Design shows readers how to use the computer to design meaningful educational materials for children and adults with special needs. A synthesis of computer graphics, education, and crafting, this book represents the author�s considerable expertise in customizing educational materials for her daughter with multiple disabilities as well as teaching other parents and teachers to create them too. 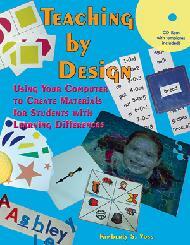 Full of instructions for designing and adapting materials and strategies for using them--including a time-saving CD-rom of templates--Teaching by Design is useful to parents and teachers of students of all ages with a wide range of disabilities. Design and customize lotto boards, interactive spelling cards, game pieces, playing cards, matching games, menus, fill-in-the-blank decals, handwriting transparencies, and more, to teach visual perception, math, language, communication, reading, handwriting, and self-help skills. Teaching Conversation to Children with Autism describes scripts that parents and teachers can use to help children learn to initiate conversation, thereby improving communication. Drs. McClannahan and Krantz have successfully used scripts and script-fading techniques based on their clinical observations and research, and founded on applied behavior analysis principles. The authors begin by thoroughly explaining the script and script-fading processes and include many examples to support the instructions. A script is an audiotaped or written word, phrase, or sentence that often reflects the child�s preferences and interests. For very young children and nonreaders, scripts are paired with pictures of desired objects or activities. Teaching Conversation to Children with Autism demonstrates that scripts are a valuable tool to improve interaction for children and even adolescents and adults. Use scripts at home, in school, in the workplace, and in the community. Meaningful Exchanges for People with Autism When children and adults with autism spectrum disorders (ASDs) have difficulty communicating, the world can be a painful and frustrating place. Fortunately, there are now tools and strategies that can help make interactive communication possible for individuals with ASDs who can�t use speech effectively. This guide to augmentative and alternative communication (AAC) provides an overview of the AAC techniques and devices available today. AAC refers to any tool, device, picture, word, symbol or gesture that compensates for expressive and receptive communication deficits. Meaningful Exchanges covers both low and high-tech varieties. 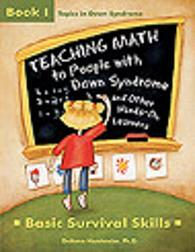 TEACHING MATH TO PEOPLE WITH DOWN SYNDROME, BOOK 1 is an essential guide that parents and educators can use to teach meaningful math to students--with and without learning problems--who struggle with understanding computation, number concepts, and when and how to use these skills. For years, the math program explained in TEACHING MATH has been successfully used with preschoolers, children, and adults with Down syndrome, autism spectrum disorders, and other cognitive disabilities. Its success lies in capitalizing on the visual learning strengths of these concrete learners and using manipulatives, games, and activities to teach and maintain motivation. A key feature of this method is the early introduction of the calculator, which allows students to progress in their understanding of math without having to memorize math facts. This book can be used to help students learn the critical math survival skills needed for living independently or help students in their math curricula at school. TEACHING MATH gives parents and teachers high-interest, hands-on strategies and ideas for teaching math to learners of all ages. An expert discusses motivational methods to teach children and adults with autism spectrum disorders valuable new skills. Learn how to use incentives (reinforcements, rewards, token systems, choice) to encourage independence and self�management skills. Newly expanded and updated, The Early Intervention Dictionary defines more than 4,000 medical, therapeutic, and educational terms commonly used by the many different professionals involved in the early intervention field. It's an excellent reference to help families and professionals successfully collaborate and understand each other's terminology. It's also useful to anyone looking for clear definitions of words related to the care and development of young children in general. Anyone who provides or receives early intervention services can benefit from this handy reference. Serving foods that are appetizing is no easy task for the parent of a child on a gluten-free diet due to condition such as celiac disease. Forbidden foods ? wheat, rye, oats, and barley ? pervade most recipes and food labels are not always clearly marked. This cookbook, however, can save families time, money, and anguish by providing clear guidelines for selecting ingredients and preparing food safely. But best of all, Incredible Edible Gluten-Free Food for Kids is the first cookbook to provide delectable gluten-free recipes formulated especially for children. The rest of the family will want to try them, too. Readers can choose from a wide array of recipes that cover every meal of the day, as well as snack-time. From breakfast muffins to Pineapple Upside-Down Cake, from Beef Stroganoff to Broccoli with Cheese Sauce, and from Quick Lunch Pizza to Hawaiian Punch, there are many dishes that should entice any child (or adult). Numerous recipes take 30 minutes or less to make and are so easy parents can involve their child in the preparation. Teaching a child to cook gluten-free ?gives the child ownership of his diet as well as reducing the desire to ?cheat?,? advises the author, a mother who cooks gluten-free for her child. In addition to food recipes, there are tips for cooking substitution, entertaining, a list of resources, as well as a detailed trouble-shooting chart for the gluten-free baker. Sanderson also offers advice on how to deal with situations outside the home that may compromise a child?s diet, such as peer-pressure and day care. This comprehensive cookbook should be in the kitchen of every family where there is a child who needs to be gluten-free. It?s also the perfect companion to Kids with Celiac Disease. This is the first practical guide for the families of children and teenagers with celiac disease, a chronic, life-long digestive disorder. As many as one out of 150 to 250 Americans is born with this genetic autoimmune condition, which is characterized by intolerance of gluten�a substance in wheat, oats, barley, malt, and other food additives�and often goes undiagnosed. In a supportive conversational style, Danna Korn shows that it�s possible for kids with celiac disease and their families to lead happy and healthy lives. Parents find advice on how to deal with the diagnosis, cope with the emotional turmoil, and help their child develop a positive and constructive attitude. Especially important is the guidance on menu planning, grocery shopping, strategies for proper food preparation, and deciding whether or not the entire family should be gluten-free. There�s even a section on junk food! What about the child who has difficulty sticking with the prescribed diet? Parents find tips on conditioning behavior and how and when to give kids some control over what they eat. Also covered is the challenge of controlling meals outside of the home�at birthday parties, restaurants, camp, and on vacation. There�s also information about how federal regulations and tax laws apply to children with celiac disease. As the only comprehensive book of its kind, Kids with Celiac Disease will be the bible for the thousands of families coping with this condition. Physicians and nutritionists too, will want to refer new families to this complete resource.